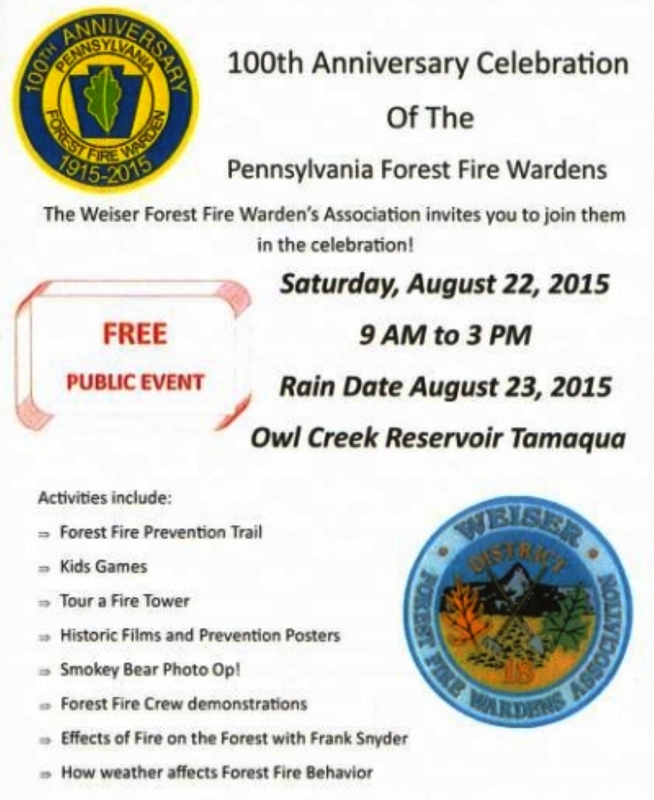 The Weiser Forest Fire Warden’s Association is holding a community event this Saturday (August 22, 2015) to celebrate the 100th Anniversary Celebration of Pennsylvania Forest Fire Wardens. Free event will be held at the Lower Owl Creek Reservoir from 9 AM to 3 PM. Rain date is August 23, 2015. – Forest Fire Prevention Trail. – Tour a Fire Tower. – Historic Films and Prevention Posters. – Smokey Bear Photo Op. – Forest Fire Crew Demonstrations. – Effects of Fire on the Forest with Frank Snyder. – How weather affects Forest Fire Behavior.